10 hens, 2 old horsefield tortoises (Oscar & Olivia) and an 11 month old Weimaraner (Jasper). I have just qualified as a Chartered Accountant and Stu is an Operations Manager for Asda Living. This Christmas we will be spending Christmas day having a huge Traditional Turkey dinner with our family and then celebrating again on boxing day with a nice pork roast with our family visiting from Spain. This will be the first time grandpa will be seeing his new grandchildren 😀 and what a variety they are. What’s on the top of your Christmas list? Wicked the musical tickets for next march showing in Brisbane, Australia. We are going to Oz in March and have seen Wicked in London and can’t wait to see it in Brisbane. I would definitely recommend the work of Gregory Maguire… he will turn your childhood fairy tales up side down! What Christmas song do you most like dancing too? Well i’m going to say “Once upon a Christmas Song” by Geraldine McQueen – just because it’s very irritating haha ….. over and over and over and over and over again! Pigs in blankets .. I dread to think how many I could get through but they are so scrummy. Yolk (she is top of the pecking order), Nugget, Tikka, Dipper, Pop Corn, Kiev, Custard, Pancake, Scramble and Meringue. What will they be eating on Christmas day? As the girls love dried meal worms, for Christmas day we have ordered some live meal worms, these will be accompanied by warm mash, some corn and curly Kale. They are mini houdinis. We let them out of the WIR into the netted area and as they can see lots of goodies growing around them, they fit through the smallest of gaps to get out to it. When one sees, they are all escape and run around ransacking everything. Why did you choose the Eglu? We wanted something that was a little bit different and liked the look of the orange eglu cube as it was bright and modern. Our chickens are on our allotment and we liked the eglu as it would brighten up the place rather than the traditional brown or green coloured wooden coops. After we bought the orange cube and multi colour shades, we got into a little trouble as the allotment rules say coops should be made of wood and a natural colour, after I argued that the eglu was more modern, had less risk of red mite etc and that their rules were out of date, the committee then changed the wording in the policy so now they are “allowed”. We have since bought a red classic as a summer house for the girls and our girls were named as “the luxury chickens” by others on the site 😀 . Before we got the chickens, we didn’t really think that they would have individual personalities really or that they might actually be clever. After watching and interacting with them, it is amazing how clever they are and how different they are to each other. They each have their own character and they are so funny to watch. Can you imagine life without chickens? No not at all. It is amazing how much pleasure they bring. Having them on the allotment makes it so much more pleasurable to visit as it brightens it up when it’s drab and dreary. They get fed lots of fresh goodies by everyone there and we are rewarded with beautiful yellow yolks in our eggs. My family get involved with them and mother looks after all the animals when we go away – I think she secretly loves it because she takes visitors, even though she has a little moan. We bake a lot more now too. Looking for a unique Christmas present for someone that loves their eggs? We have just the thing! Instead of browsing through our website for a suitable selection of eggstraordinary gifts why not opt for one of our pre-selected packs that are perfect for egg fans everywhere. Each pack contains either the boiled, scrambled, fried or freshly laid t-shirt, along with two other matching goodies, so whichever is their breakfast of choice, they’ll be sure to love it. Buying these packs will save you money too – at only £20 they’re eggcellent value! So discover what’s in these eggciting packs and you might even be tempted to treat yourself while you’re at it. And don’t forget about the great offers we have on at the moment: trade in your old chicken house and we’ll give you £50 to use towards a shiny, new Eglu. And, spend over £50 and you will qualify for free delivery if you enter this code: NEWSDELIVERY. In this week’s competition you can win the Egg Fan Gift Set of your choice and if you are an egg aficionado you should find it over-easy! All you need to do is send us a photo of you with your favourite egg dish. It’s as easy as that! Whether you like your eggs nice and simple or you have an eggstra special dinner that you like to rustle up, we want to see it! Next time you sit down for your big breakfast just take a pic and send it to stephanie@omlet.co.uk. The hungrier it makes us the better. We have three Egg Fan Sets to give away so it’s well worth entering, and you have until Friday 3rd December to do so. Good luck! Trying to find a Christmas present with a difference? Why not treat someone to a hentastic day out? Paul Peacock, author of numerous books and host of many brilliant beekeeping and chicken keeping courses is running an eggstra special course called the Big Hen Wing Ding, in January. It will be his first ever poultry seminar, packed full of information, workshops and fun for chicken keepers. Unlike the usual course this one will include lectures and some guest speakers, including Omlet, who will be talking about the wonderful Eglu. Seminars and workshops will vary from beginner to more advanced topics, so if you are looking to keep hens for the first time, or you want to learn a new skill, such as incubation, this whole day event will be ideal. The Big Hen Wing Ding will be on Saturday 29th January, starting at 10am. The usual ticket price is £25, to include lunch and a donation to BHWT, but if you book now you will get £5 off. So whether you want to book yourself a new year treat or you want to surprise a chicken keeper this Christmas, click here to book now! Have you always wished you owned an Eglu? Do your chickens or rabbits dream of staying in such stylish accommodation? Do you wish you didn’t have to spend so long cleaning out your old wooden hutch every week? Well call us your Fairy Godmother because your wish is our command! Not only will we take the crumbling, rotting wooden house off your hands, but we will give you £50 towards the cost of a brand new, sparkling Eglu. There’s no catch here, we would just prefer to see gardens everywhere glowing with brilliant, bright Eglus. Chickens and rabbits everywhere will be warm and cosy, clean and care-free and safe from foxes, and owners will be a happier bunch knowing they can clean the Eglu in minutes. You can trade in any wooden pet house, no matter what the age, make or condition. 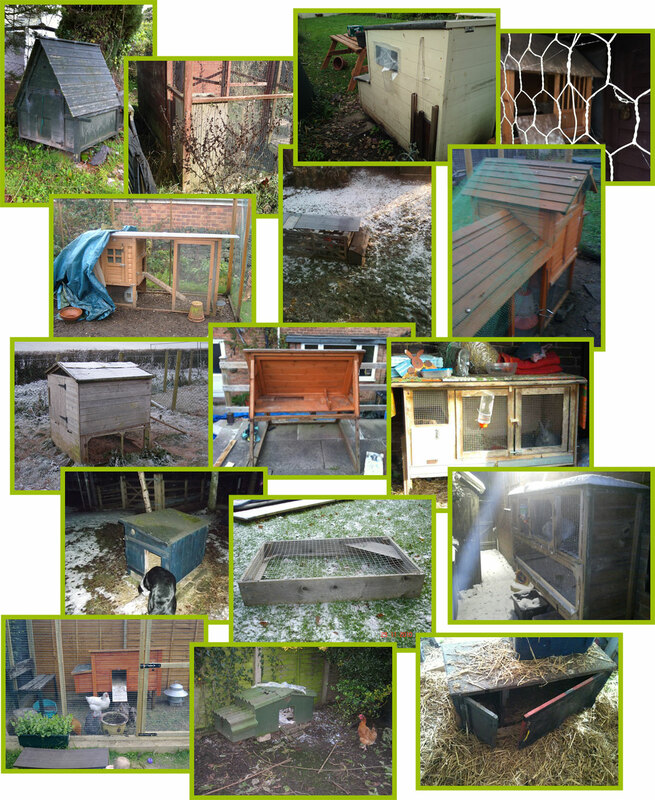 So click here now or phone 0845 450 2056 to be one step closer to owning your dream chicken house! Or if you’ve noticed an unsightly looking wreck in someone else’s garden why not let them know about the offer? They might just thank you for it! Thinking of keeping chickens but completely confused about health products? Instead of trawling through our product range why not opt for our Ultimate Chicken Health Pack? It contains 13 of our most popular products that will keep your chickens happy and healthy, and your Eglu hygenic. At less than £60 it is a bit of a bargain too, saving you 10% on the price of buying the items seperately, and don’t forget that on orders over £50 you will qualify for free delivery too! Just use this code: NEWSDELIVERY at the checkout. This pack includes Mixed Chicken Grit 1.25kg, Verm-X for Chickens, Diatomaceous Earth – 100g , Chicken Spice – 450g, Citricidal 45ml, Red Mite Powder – 500g, Chicken Tonic – 500ml, Clean-n-Safe Pet Disinfectant, Garlic Powder, Johnsons Anti Pek Spray, Poultry Cider Vinegar – 1L, Johnsons Scaly Leg Lotion, Veterinary Wound Powder 20g. There are only five weeks til christmas and the shopping rush has well and truly begun! But if you can think of nothing worse than traipsing in and out of busy shops, fighting your way to the last must-have toy and queuing for an hour just to pay for the blinkin’ thing, then don’t panic, help is at hand. Visiting the Omlet online shop is a stress-free eggsperience that will have you giggling rather than gasping. Our Christmas section is now open for custom and brimming with gifts, gadgets and goodies that will make you ooh and aah. With a selection of everything from toy tea sets to cappuccino candles to surprising nuts (surely that ones worth a click), you will find something for everyone. So why not put your feet up, make yourself a coffee and browse our christmas gifts at your leisure! Don’t let the wind and rain get you down this weekend because we’ve got some fantastic offers that will bring the sunshine straight to your door. Now, we can’t promise that our weekend specials will really make the sun come out but they will certainly help brighten your day. So why not treat yourself, and your chickens? With the days getting darker and the need to stay indoors and snuggle up on the sofa getting stronger, you’ll probably be shutting your hens in their Eglu earlier during the Winter. So why not treat them to an early Christmas present in the form an Eglu Run Extension. Your hens will have more room to frolic, whilst being safe from foxes and you won’t need to keep an eye on them. The great news is that we have reduced the price of all run extensions for one month. Eglu Go Run Extension was £79, now £49! Eglu Run Extension Kit A was £79, now £49! Eglu Run Extension Kit B was £79, now £49! Cube Run Extension – 1M was £100, now £89! Remember, these offers will last one month only so why not beat the crowds and order now!? Good news for all Eglu Go owners out there – you can now buy a winter shade to keep your chickens warm and dry through the rain and snow. But we haven’t forgotton those of you that have an Eglu Classic – you might like to plan ahead and save with our pack of winter and summer shade and bungees. And Cube owners don’t despair because there are some great new offers for you too – buy a pack of two of three wind shades and save money. Perfect for giving you chickens the ultimate winter wonderland. We’re also offering you the chance to save even more money by giving you free delivery on your order. Just spend over £50 and the jolly old postman will deliver your parcels free of charge. All you need to do is add your products to the basket, pop in the secret code below and bob’s your uncle! Rememember remember the fifth of November! Yes, we know we are a day early but we thought we’d better send you this before you start your celebrations. So enjoy the newsletter and we hope your weekend goes with a BANG! And it’s not just people that can carve a decent pumpkin you know!? Rumour has it that there are one or two chickens out there that can do the job just as well. We spotted Kay’s photo of her chickens on the forum having a good old chomp at the Halloween veggie, and it goes to prove that pumpkin pecking really is the latest poultry past-time craze. Either that or they just like the taste of it. We much prefer the idea that these hens are learning skills in sculpting though, and that next year we will be receiving even more hentries to our Halloween competition. This weekend whether you’re planning on going to a local event, having a party or staying at home, you’re bound to hear the bangs and whistles of a few fireworks. Although bonfire night is a very eggciting time for many, it’s important to think of your pets, because chances are they will find it more frightening than fun. Although many chickens won’t be bothered by the noises at all, there are a few that will be and you might want to bring yours in for the evening to be on the safe side. Just put them in a spacious cardboard box, lined with straw, with plenty of air holes and they will be happy until the morning. Check the garden for ashes the next day because chickens will head straight for them when they’re let loose again, and dispose of any firework debris you might come across. If you are passionate about poultry here is a date for your diary: The National Poultry Show will be held on November 20th-21st this year, at National Agricultural Centre, Stoneleigh Park. This is one of the largest poultry shows in the country, with around 5,000 beautiful birds on display, some terrific trade stands and some pretty poultry for sale too! We will be there so if you’re thinking about buying someone an Eglu for Christmas this is the perfect opportunity to see it in action. Try opening the eggport and holding a hen, and ask us any questions you might have. We hope to see you there! With Halloween just around the corner we think we’ve kept you waiting long enough for the launch of the annual Omlet Pumpkin Carving Competition! We’ve had a few entries already from some eager spooksters, but the competition is now officially open. Get your pumpkins at the ready and carve away for your chance to win this week’s star products, featured later in the newsletter. This competition always proves popular and we have had some eggstraordinary entries in the past so we eggspect nothing less this year. When you’ve created your Halloween masterpiece send a photo to stephanie@omlet.co.uk. But hurry, you only have until next Wednesday, 3rd November to get your entries in. Good luck! 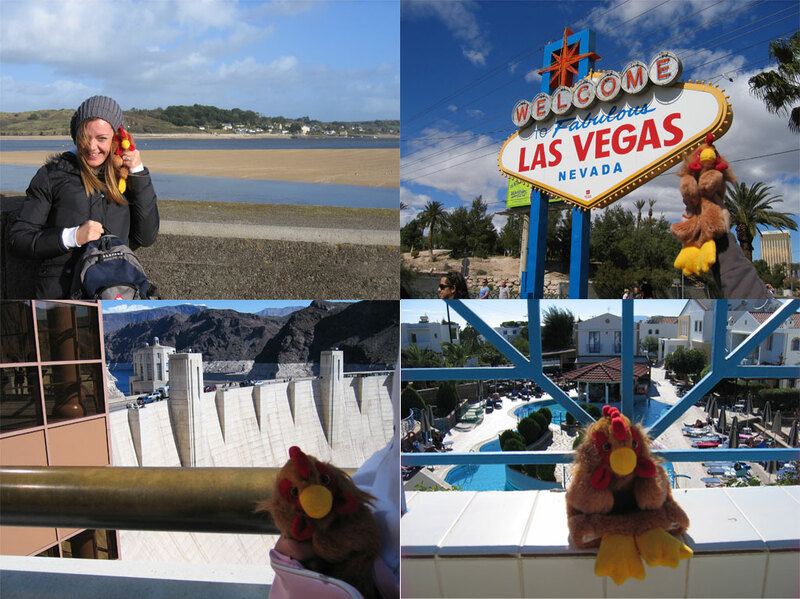 Last week Mel emailed us about her travelling chicken and we thought we’d share it with you! As we can’t take our hens or Eglu with us on our travels, my husband Roger and I take Bergerg with us when we go on holiday – so far he has been to Cornwall, Las Vegas (including the Hoover Dam), Rhodes and Silverstone to watch the Motogp! We always try and take a couple of pictures of Bergerg at famous landmarks or at least a picture of him on location. He has even been searched at Customs – now that was embarrassing! Now there’s a question – if any of you take your chicken (real or not) on hol, send us a photo, or a postcard! And click here for more photos of Bergerg around the world! Not a fan of Halloween? If you want to do something this weekend that doesn’t involve ghosts and ghouls why not come along to the National Honey Show at St George’s College, Weybridge. This is a prestigious event in the world of beekeeping and these guys really know their honey! There are numerous stands, workshops, lectures and competitions that make it an entertaining show for professional beekeepers, newbees and those who simply have an interest in bees and honey. And of course we will bee there for our second year, with the Beehaus, and with a few jars of honey that we hope will win prizes. Come and see how it works, have a chat and sign up to a beekeeping course if you want to get some hands on eggsperience. Members of the public are welcome to come along and bee inspired so why not visit the website for more info. Happy Halloween from the Omlet Team! Has the Eglu got the Eggs Factor? We think so, and so does Alan Titchmarsh! Unfortunately our chickens haven’t become the latest ITV singing sensation, but they did star on the Alan Titchmarsh Show on Monday, alongside the love-em-or-hate-em duo Jedward. It’s not the first time Omlet have been invited to this show either, because Alan is a proud Eglu owner himself. Missed the show? Click here to watch now! Two weeks in and the Omlet shop is in full swing. It’s been great seeing so many happy faces already and we hope to meet lots more of you in the coming weekends. With Christmas quickly ap-poaching (yes, it is only two months away) you’ve got the perfect eggscuse to come and browse our wonderful range of products and find one or two unusual gifts. The shop is open every weekend and you can find us at Barn Farm Plants garden centre, in Oxfordshire. Click here for the map! Read more about Dorothy’s story on Roberta’s blog The Poet in You. Listen up everyone! Here is your final chance to enter our fantastic competition to win some posh nosh for two. The winner and a friend will be treated to a slap-up three course lunch, with bubbly, at one of four award winning restaurants. Choose from Paris House, Bedfordshire, L’Ortolan, Berkshire, La Becasse, Shropshire, or The Carved Angel, Dartmouth (opening in January). Run by Alan Murchison, michelin starred chef and star of BBC’s Great British Menu, you can be sure to enjoy eggsquisite food at whichever restaurant you choose. You’re hungry for the prize now, right!? 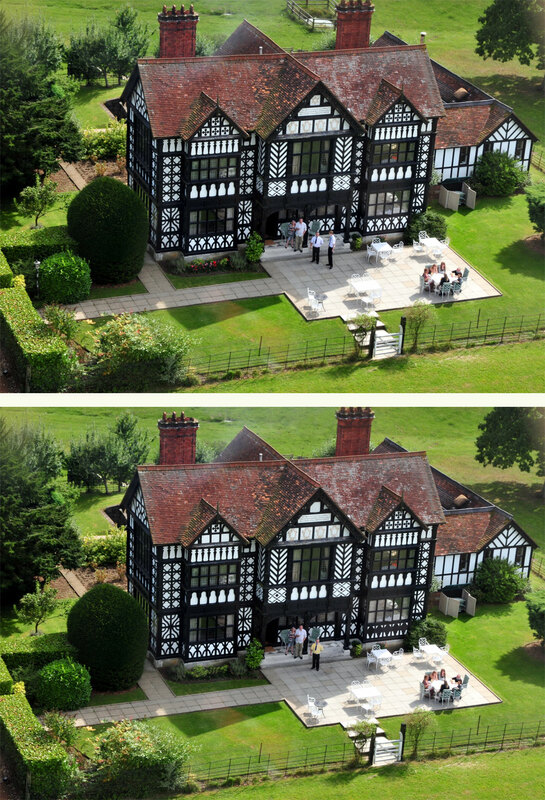 Well here’s the competition…a Spot the Difference! Study the two photos of Paris House and find the 10 differences, then send your answers, written or circled, to stephanie@omlet.co.uk. You have until this Sunday, 24th, to enter so get your specs on and get spotting! P.S. Don’t forget out annual pumpkin carving competition – more details in next week’s newsletter! You haven’t heard from us in a while but that’s because we’ve been busy making the newsletter even better than before. The first cool change is that we’re saving you a click, because the newsletter us now right before your eyes. Secondly, we’ve got a great new feature called Tested by Barbara that we know you will find useful. And even more eggcitingly you can eggspect to see a brand new design next week too! Let us know what you think and if you have any photos, jokes, stories or recipes that you would like us to feature, please send to stephanie@omlet.co.uk. Enjoy! First for some very eggciting news straight from Omlet HQ. We first started selling the Eglu in 2004 and our range of products, large and small, has been eggspanding year on year ever since. Although our website is great for ordering Eglus, chickens and other bits and bobs, we know that lots of you would prefer to see our products in the flesh before buying. So, we thought it was about time to try something new…we are venturing into the unknown and opening our very first shop! Opening at weekends, the Omlet shop will give you the opportunity to see our eggstraordinary range of products like never before. Peek into a Beehaus, flick through a book, touch an egg cosy, or even stroke a chicken, and after you’ve had a good old mooch around you can pop into the garden centre next door and enjoy a cup of coffee. So why not pop along for the grand unveiling this weekend? You will find us in the picturesque village of Wardington, Oxfordshire, alongside Barn Farm Plants. Click here to find us! We will be there Saturday 9am – 5pm and Sunday 10am – 4pm. We’d love to see you! All was calm at Omlet HQ on Tuesday morning. It was just another day at the office…for the first couple of hours. When the clock ticked to 10:30am something strange happened. Orders started flooding through so quickly that we couldn’t keep up. Orders for a a few items in particular. Orders for Spiral Egg Racks, Fried Egg Earrings and Flip Egg Spatulas…and loads of them. But what was the reason for the sudden rush in eggcessories? It was then that we realised our products had just made an appearance on ITV’s This Morning. In light of British Egg Week Holly Willoughby and Philip Schofield were joined by Edwina Currie to show off a range of egg gadgets. And despite Edwina’s previous fiasco with eggs, she embraced the eggsperience and wore the earrings with pride. If you missed the feature you can catch it again by clicking here. And why not visit the British Egg Week website for some great recipes and competitions. This weekend Grand Designs Live will be taking to the stage again, at the NEC, Birmingham. Running from today until Sunday, the UK’s number one home show is brilliant for anyone that’s interested in home and garden, gifts and gadgets and new technology. Whether it’s some early christmas pressies you’re after or a whole new load of furnishings for your home, this is the show to visit. Potter around the array of stands, nosy through eco show homes, watch live cooking demos and finish with some tasty grub at the Grand Gardens Cafe (or, if you’re feeling flash, the Grand Restaurant by John Burton-Race). We will be on stand G130, in in Grand Gardens section. Come and say hello, see a demo of the Eglu and Beehaus, and browse our selection of gifts and accessories. It opens at 10am each day and you can book tickets online now. See you there! So now that we’ve got your tastebuds tingling we can reveal the competition. Some find it easy, some find it frustrating, but one thing’s for sure, it always proves popular…yes, it’s that good old Spot the Difference! Simply look at the two photos of Paris House and find the 10 differences, then send your answers, written or circled, to stephanie@omlet.co.uk by Sunday 24th October. Good luck! There’s a definite chill in the air and shorts and skirts are being quickly replaced with jeans and fleeces. And as the Autumn creeps in we think it’s time to give your hens some TLC. A dash of Chicken Spice in their food every day will keep them perky through the cold months, a Winter Shade will keep them nice and dry in the Eglu and for a real treat give them a handful of Organic Mixed Corn every day – they’ll love it, and they’ll love you for it! Although wooden beehive owners are often alarmed by the brightly coloured Beehaus, Ian seems impressed by the design: “The boldly coloured plastic stands out against the green overgrowth (good aesthetically and easy to find…). In fact, it’s the perfect way to brighten up the garden over the dull, grey winter. Also this month the Beehaus has appeared in the the Guardian Autumn Hotlist 2010. Beekeeping comes out at a bee-rilliant number 7 in the top 20, alongside The Inbetweeners, gappy smiles and local food, and the Beehaus is their hive of choice! Perfecting the art of the poached egg is a challenge, by anyone’s standard. Even chefs get flustered from time to time trying to deliver the perfect egg. It’s so easy to get it a bit too runny or a bit too hard, the white swirling everywhere or the egg splitting altogether. And that’s if you’ve managed to get the egg out of the shell whole in the first place. Well fear not fellow egg fans, for we have found the guide to producing the ultimate poached egg. Read it, practise and then impress friends and family with your fabulous cooking skills! And if it goes really well why not send us photo of the final dish? Have you ever wondered which hive comes out top for beekeepers? If you’ve been thinking about keeping bees and you’re unsure about which accomodation to choose, you might find this comparison helpful. Written by a Surrey beekeeper, this blog summarises his eggsperiences, problems and discoveries in his quest for a self sufficient(ish) life. Trialling both a traditional hive and the Beehaus, he compares the ease and effectiveness of both…and the Beehaus gets some bee-rilliant feedback! But don’t take our word for it – Click here to read now! There’s still time to enter this month’s competition…so why not give our breakfast wordsearch a go? It’s easy as pie and you could bag yourself an eggcellent t-shirt. Just search for the food themed words below and send your entry to stephanie@omlet.co.uk, or Stephanie, Omlet Ltd, Tuthill Park, Wardington, Banbury, Oxon, OX17 1RR, by Tuesday 21st. Words: Bacon, Baked beans, Coffee, Croissant, Fried egg, Muffin, Mushrooms, Orange juice, Sausage, Scrambled egg, Toast, Tomato. Eggs are bad for you, eggs are good for you…the eggsperts just keep on changing their minds, but the latest news concludes that our favourite food really is eggcellent for your health. The humble egg is so full of vitamins that it is the best way to start the day, and scientists claim it is good for your heart, good for your eyes and good for your bones. So there’s a good eggscuse for a full English breakfast! To celebrate this brilliant news we have a rather tasty competition for you. And it’s over-easy too so we eggspect loads of you to enter. It’s a wordsearch, with a breakfast theme! Just find the words below, then send your completed wordsearch to Stephanie, Omlet Ltd, Tuthill Park, Wardington, Banbury, Oxon, OX17 1RR. Or email to stephanie@omlet.co.uk. The winner will get their hands on their choice of egg t-shirt and some other goodies. Bacon, Baked beans, Coffee, Croissant, Fried egg, Muffin, Mushrooms, Orange juice, Sausage, Scrambled egg, Toast, Tomato. You may remember the mystery behind our last Eglu Owner of the Month…Meg had been the lucky winner of our Eglu Go competition and we were honoured to feature her in the newsletter. But the problem was no one knew what she looked like. Luckily, she hadn’t gone into hiding and a few days after the newsletter was sent we received a photo of the lovely lady. More eggciting news though…the next day Meg emailed us to let us know that Miss Cassandra had laid her first egg, just double the size of a marble. And a day or two after that Miss Catherine did the same. Well, we do our best to make people happy! Last month we launched a competition just for kids, to celebrate the school holidays and the Beehaus’ 1st birthday. We wanted you to send us your bee-inspired artwork and you didn’t disappoint. There were some bee-rilliant entries but the one that got us buzzing the most was a colourful picture of the Beehaus, complete with cartoon bees. Although we’ve never seen a bee hanging out her washing before, we like to think that this is the kind of hive of activity that occurs in all our Beehauses. The artist beehind this picture is Emily Rowell, aged 13. We will be sending her a fantastic USB microscope along with a few other goodies. If any bees are hanging out their undies Emily will be able to see with her new gadget. What should you do if you get stung by a bee? Put a penny on it! Struggling to get the punch line? That’s because this isn’t a bad joke, for once, but a real piece of advice. Now whether it really works or not, we have yet to discover, but according to an email we received, a penny really is the cure for your bee sting. After being stung, simply tape a 1p or 2p coin to the affected area for 15 minutes and the pain and irritation should disappear. We’re not sure how this works exactly, but it’s supposed to have something to do with the copper. Could this bee the cheapest antidote ever? We’d love to know if this trick really does work so let us know if you’ve tried it! increasing the price of some of the Eglu range. for a full list please see the Omlet website. we will not take payment until the day before delivery. Remember the fantastic Eglu Go (suitable for up to 4 chickens) is still £330 including 2m run and accessories. P.S With kids going back to school on Monday why not make their last weekend off a fun one, by going to the Moreton-in-Marsh Show? This agricultural show has loads of livestock, tonnes of trade stands and amazing attractions, including an eggscapologist. We’ll be there so come and say hello! Craft corner is now open for business! Come inside and have a browse at our first selection of handmade goodies, perfect if you’re on the lookout for a gift that’s a little bit out of the ordinary. If it’s jewellery that takes your fancy we’ve got an eggstraordinary selection, including some beautiful glass pendants, as featured later in the newsletter. Keep an eye out over the next few weeks for more individual items being added! And if you like the idea of selling your handmade items in the Omlet shop please get in touch. We are on the lookout for all sorts of bits and bobs so don’t be shy, whether you’re into ceramics, sewing, stained glass or anything else, just email stephanie@omlet.co.uk with your idea. Ever wondered what to do with your empty egg boxes? Well someone obviously has because they have written an article all about it. Written for the eco-friendly website Earth911, the feature gives six different ideas of what to do with your egg boxes, and some of them are pretty nifty. For eggsample, how about using them to store your christmas decorations or to grow some plants? So if you’ve got a few boxes lying around and were planning on throwing them away, why not read the ideas and get the kids to try some out. It’ll keep them amused for a while and give you some peace! Well, not quite…There were two families that really had the eggs-factor and we just couldn’t choose between them, so we have decided to make them both stars of Omlet TV. The Elwells are going to be the lucky owners of an Eglu Go and the Tyler-Jones are going to receive an Eglu Cube. Neither family has kept chickens before so they are very eggcited about this new venture, and we will be filming them every step of the way. In the meanwhile, keep an eye on the Omlet TV channel bee-cause we are regularly adding new videos about keeping Bees. Listen up kids! There is still time to enter this month’s competition if you haven’t already, and you could win some bee-rilliant prizes, including a USB Microscope worth over £50. To celebrate the Beehaus’ first birthday we want you to come up with a piece of bee inspired artwork. It could be a photo, a painting or a collage…or anything else you can think of. You can send your piece of art to Stephanie, Omlet Ltd, Tuthill Park, Wardington, Banbury, Oxon, OX17 1RR, or email it to stephanie@omlet.co.uk by this Sunday. Please include your name, age, address and email address. There aren’t many people that can say they have 60,000 workers but Margaret Wilson, chairman of Sector Security has just that. They’re a bit different to her usual employees though and they’re creating a buzz in the company. That’s bee-cause these hardworking creatures are bees. Margaret already kept bees, with a few of her own hives in her garden, but she wanted to help the honey bee population by creating a home for them on the roof of her business too. The company in Blackpool now sites an Omlet Beehaus, surrounded by flowers and a real hive of activity. Where and with who do you live? I live in Brentford, West London, with husband, Andy, two children, James (10yrs) and Macy (7yrs), two cats and fish in the pond! What made you decide to keep chickens? As we began to learn more about our food and where it came from, we started to eat organic food and had a go at growing our own in the garden. I wanted to give chickens a try then Andy saw the Eglu at a design exhibition and a plan was ‘hatched’! How many chickens do you have and what are their names? Oooh, at the moment we have eight girls in an Eglu Cube: Auren, Ruby, Pearl, Butternut, Ascot, Linen, Maddy and Coucou. They are all different breeds and thankfully lay different coloured eggs, so we can tell who is laying each day. Linen (Light Sussex) lays a white egg and Pearl (Crested Cream Legbar) lays blue! The design is fantastic! It looks great, it’s easy to clean (there’s no bending with the Cube! ), but the best thing is how safe it is… We’ve had London foxes crawling all over it and the girls inside are just fine! What do you like doing when you’re not hosting hen parties? If you want the truth… I used to demonstrate Tupperware! The Eglu is just a bit bigger….. But seriously, the chickens have become such a part of our family life that the nick name for our home is ‘Hen Corner’. Friends and family are always interested and some of them have now gone on to keep chickens, so if we can help introduce others to chicken keeping, it’s got to be good all round, hasn’t it? Our first course was in May ’10 and we felt it went well. We had some great people on it, some travelling quite far to be with us, and we slightly over ran on time due to all the questions! As we are based in London, we decided to run an early evening course, so that people could come straight from work, this was well received as weekends can be precious. We were thrilled with the reviews they gave us! What do your courses include? We start with drinks and something to eat, then we follow the course notes and include choosing breeds, chicken health, weekly and seasonal care, cleaning the Eglu, eggs and much more. We finish with questions over cake and everyone goes home with a goody bag, course notes and a certificate! Attending a course gives you a first hand experience of keeping chickens from people who incorporate it into their every day life. Seeing an Eglu in a back garden, holding a chicken, helping to clean it out are great starting points as people decide whether to try it for themselves. It’s a small and easy step on what could be a fantastic adventure…. There’s nothing to lose, and everything to gain! Schools break up today, wahey and lots of you will be jetting off on holiday for a week or two of fun in the sun. But if you’re staying at home here’s another newsletter to keep you hentertained…and when you see the details of our new competition you might just be glad you haven’t got plans for the next two months! We had an amazing response to the Eglu Go competition, with hundreds of inspiring entries. There were poems and photos, tragic tales and pleas and some funny little stories along the way. It was a mammoth task to choose just one winner, but a decision had to be made.. So congratulations to Margaret Etzel. We hope you enjoy it! The more eggciting news is that we are now on the lookout for another family to take part in a chicken versian of this, so if you didn’t win last month’s competition, here is another opportunity for you to get a brand new Eglu Go plus chickens. Not only will you receive the best chicken house a bird could ask for along with our personal eggspertise, but you will be a tv star…just imagine! Think your family would be perfect for the role? Just email stephanie@omlet.co.uk with your details, and ideally include a photo of you and your garden. The closing date for entries is next Wednesday 28th July, so be quick! We are a nation that loves eggs. Boiled, scrambled, poached or fried, it’s a favourite for us Brits. But we didn’t eggspect them to be even more popular in India…where restaurants are dedicating entire menus to the humble egg. That’s right, there are restaurants all over the country that are making eggs the focus of their food. In many of these places you won’t be able to find a single dish on the menu that does not contain eggs. How eggstraordinary! Eggsunday is one of these popular outlets, located in a busy food court in Mumbai. Customers sit and watch as the chefs cook egg after egg (700 a day on average), and as well as the usual dishes of omelettes and egg biryani, there are some more unusual dishes on offer such as Spiceggsunday – a dish made from hard boiled eggs topped with hot sauteed vegetables. The best-selling dish is the Bomblette pav – a basic omelette filled with the owner’s secret masala. This is one we are very tempted to try, so we might just have to take a visit…purely for research. Read the article from the Times of India by clicking here. We know that bee numbers are in decline, but now there’s some good news for beekeepers. Rumour has it that this season will be great for honey production. Despite the fall in bee numbers, the cold winter and warm spring has caused our busy bees to work overtime and produce more honey. Most hives produce around 50lb of honey a season, but some farmers are harvesting three times as much. This is good news for apiarists everywhere, so if you keep bees you might be enjoying lots of honey on toast for breakfast this Winter. Let’s hope you’ve got a sweet tooth! Read the full article from the Daily Mail by clicking here. The RHS Show at Tatton Park is currently running until this Sunday. This is a colourful show full of food, fun and flowers. See inspiring show gardens, eat some tasty grub and say hello to our chickens. Kids 16 and under go free and if you order tickets on the website you will save £5.00. Also running until Sunday is the CLA Game Fair at Ragley Hall. Kids will love to have a go at all the activities on offer, from archery to quad biking to trampolining, plus there are some eggciting displays and loads of stalls. The New Forest Show will be running from 27th – 29th July. This is a great show with displays from the Devil’s Horsemen, miniature horses and of course our brilliant chicken houses! Visit the website for more info. And after all that fun why not chill out at the Big Chill Festival at Eastnor Castle in Herefordshire. This is a festival that’s suitable for all the family, with music from top artists, yummy food and loads of stalls, so come and say hello! In third place was Sarah’s Greek omelette, with red onion, tomatoes, olives, feta and oregano. This classic combo tasted great as an omelette! 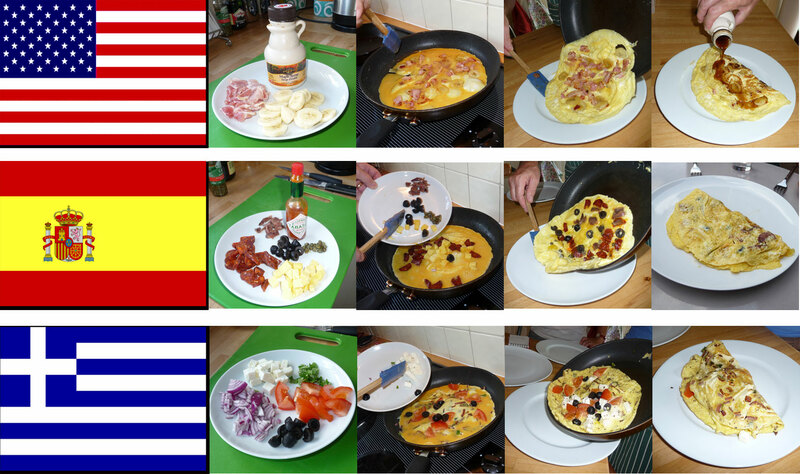 Coming in a close second was Michelle’s Spanish omelette, with olives, capers, anchovies, chorizo, manchego and tabasco. A fun recipe that was full of flavour and a perfect footie snack. But pipping it to the number one spot was Emma’s American omelette…Now, the thought of eating eggs, bacon, bananas and maple syrup may make your stomach turn but this omelette was surprisingly scrumptious. Eggspectionally moreish – the plate was clean in seconds and we urge you to try it! Click here to see the three omelettes being cooked. Prizes are on their way to the winners but a big thankyou to everyone that entered. The Eglu is becoming more popular by the day, popping up in gardens everywhere and making chicken keeping a trendy hobby. It’s not just family gardens you’ll see them in though, we often get orders from schools and even the occasional restaurant, and if you’re lucky enough to be dining in Paris House anytime soon you might just spot a green Eglu Cube while you’re there. You can read what they have said about the Eglu by visiting their website, or why not treat yourself to dinner there to see it for yourself!? It’s two weeks since we launched our latest competition to win an Eglu Go and you have sent you entries by the bucketload. Hundreds of you have emailed in to tell us why you want to win this amazing price and we have been slowly but surely trawling through them. There have been some eggcellent entries so far and we’ve still got over a week left of the competition – crikey! So if you missed it the first time round because you were too busy watching the football or enjoying the sunshine we will give you one more chance (because we’re just nice like that)! If you want to win a fabulous Eglu Go, complete with two meter run, feeder and drinker, summer shade and 10 egg boxes just send us an email telling us why you want, or deserve, to win one. Simple! Send your entry to stephanie@omlet.co.uk by Sunday 11th July. Good luck! Our products have been hitting the press again this month, with loads of brilliant comments and some rave reviews. Sainsbury’s Magazine has an article about the mix of city living and country life. Apparantly “a taste of rural life offers a chance to get away from it all” so there are more and more urbanites taking up hobbies like keeping chickens. Anneliese Rigby lives in South London with her husband, 5 cats and 2 hens. She first saw the Eglu when having dinner at a friends house and after tasting their eggs she decided to buy one herself. She says that watching her hens Margo and Barbara is “like a scene from a slapstick comedy”. And let’s not forget the bees…The Sunday Telegraph has launched the Bring Back Bees campaign to raise awareness of the decline in bee population. The article explains why we need bees – mainly because they are essential for growth of one third of our crops. You can help by sponsoring a beehive or making your garden bee friendly, or if you want to try keeping bees yourself the article suggests going on one of the Omlet beekeeping courses. And talking of bees, it’s no secret that bees are special little creatures; they pollinate our food, make tasty honey and they really are rather clever. But these bee-rilliant insects may just have gone one step further to impress us human beeings…it has been discovered that honey bees could help in the fight against the hospital bug MRSA. The sticky substance that bees make, propolis, has been found to stop the MRSA bacteria from growing. It has been tested on 15 strains of the bug and was effective against them all. Although propolis has been used as a folk remedy for years this latest research could lead towards developing new antibiotics. And the reason for it being investigated was that it is already used as an antiseptic by bees to seal gaps between honeycombs and preserve their hives from contamination. The longest day is almost here and we are all loving the eggstra hours of sunshine (hens included) and that’s not the only thing that’s great this month; June is all about fetes, food and football and everybody’s having fun. So here’s another newsletter to make your Friday even brighter, and if you don’t like the football you can save it to read later for a bit of peace and quiet. Think your chicken lays whoppers? Not compared to this one… A six month old hen called Harriet has just laid a record breaking egg with a circumference of 23.1cm and 11.4cm in length. The typical circumference of a chicken egg is 14cm, so this is a bit of a giant in comparison. Poor Harriet had only just started laying when she produced the egg, and although she limped a bit afterwards her owner, Tony Barbouti, said it didn’t put her off laying again. Mr Barbouti has been keeping hen for 30 years and said “My hens have laid big egg before but when I saw this one I was gobsmacked.” Unfortunately, the pet boxer Bodie soon broke another record by nudging the egg and cracking it while it was in position for its photo shoot. Although this is the biggest egg on record, amazingly it is nowhere near the heaviest. In fact at 162g it is less than half the weight of the world record holder – a double yolked, double shelled phenomenom of 456g. Eggstraordinary! Have you always fancied keeping a few chickens in your garden? Do you dream of having a beautifully bright, designer coop in your garden? Can you think of nothing better than pottering outside each morning to collect fresh eggs for your brekkie? If the answer is yes, yes, yes then you are going to be flapping your feathers with eggcitement at this month’s competition…we’re giving you the chance to win an Eglu Go! Now calm yourselves ladies and gents, take a breath and read what it is you have to do. It’s simple really, just tell us why you want to get your hands on an Eglu Go. Whoever we think deserves it most will receive an Eglu Go complete with two meter run, feeder and drinker, summer shade and 10 egg boxes. Just email stephanie@omlet.co.uk before Sunday 11th July and you could be collecting the tastiest eggs before you know it! We eggspect one or two of you might be spending this evening sitting on the sofa and watching the screen, because, as if we need to mention, England will be playing their second World Cup match. It’s great to support the team, but besides the football shirts and vuvuzelas how else will you be showing your patriotism? With this egg cup of course! Perfect for the football fanatic this England footballer egg cup will strike up a conversation at the breakfast table. Draw a face on your egg to turn it into your favourite player and have a kick about every morning. What better way to start the day? We’ve even sent a set of these egg cups to the England team to wish them good cluck! If we lose miserably you can always hide it in the cupboard in shame until 2014! There is limited availability on these so if you want one grab it quick for £4.50! Omlet fan Lewis recently got in touch to let us know the latest in his world of chickens. He knows it all when it comes to hatching and rearing and lately he has been busy looking after a new litter. It looks like he has his hands full with seven gorgeous little chicks but there is a duckling too! One of his broody hens stole a duck egg and looked after it until it hatched. We just had to share this photo with you. The new arrival, Orville, is definitely no ugly duckling, in fact he is such a looker he could have just stepped off an Easter card. Unfortunately there isn’t enough room to show you all the photos of Lewis’ adorable chicks but you can watch them on his youtube video by clicking here. And if you are now feeling broody and you want to try hatching some eggs you can read his brilliant guide here. News just in from Gardeners World Live… Quin has just been interviewed for BBC West Midlands Radio from the Omlet stand. He was asked all about the Eglu and he managed to get someone to take a snap of his moment of fame. We don’t know when it’ll be broadcasted yet so make sure you keep an ear out! And if you want to check out the Eglu you can visit us at the show until Sunday. P.S. It’s Father’s Day this Sunday so don’t forget to treat your Dad to breakfast in bed! P.P.S. The omelette competition has now closed and we have shortlisted our favourite recipes…the winner will be revealed in the next newsletter! According to the met office summer has officially started and this year there are new promises of a scorching bbq summer, hooray! Bees are busy pollinating, chickens are dustbathing and people are picnicing – happy days. So in this newsletter you’ll find some products perfect for taking on a picnic, a super summer recipe and an update on this season’s shows. Enjoy! There’s still time to enter our latest competition and it’s so easy you might as well give it a go. With the World Cup kicking off this month we want to find the perfect football inspired omelette. All you need to do is come up with an idea for an omelette to represent one of the participating countries. We don’t eggspect you to cook the omelette or even write a recipe, just send us your basic idea. We will shortlist our favourites to cook up and put to the taste test and the winner will receive an eggciting prize…£25 to spend in the online shop, plus a selection of goodies that will help you cook your award winning dish. Just send your idea to stephanie@omlet.co.uk by Sunday 13th June. Don’t be shy! Most of you will recognise Bill Turnball as the face of the BBC Breakfast Show, but more recently he has had the nation buzzing for a very different reason – his beekeeping experience. After 10 seasons of keeping bees he is quick to admit that he is no professional and has had his fair share of problems (killing three queens is just one of them), but he finds the hobby calming and even theraputic. Bill was first intrigued by bees when a swarm was retrieved from his garden, and soon after his daughter pointed out a sign for beekeeping classes. He said “it was the challenge that appealed”…and 10 years on he has experienced the ups and downs of this challenge; “When it’s going well it’s great, when it’s not going well it’s very frustrating.” Despite his haphazard method to beekeeping he has been made the President of Northen Ireland Beekeepers and as part of the BBKA campaign he will be out and about spreading the word this summer. If you have been inspired by Bill and you too like the appeal of a challenge as much as he did, why not go on a beekeeping course? We have a whole bunch of beekeepers that are happy to help, with courses all over the country, so visit the course page to fine one near you. A couple of months ago we let you in on our idea of starting a crafts section of the website. This will be a whole section dedicated to handmade items, made by people like you – how eggciting! We know that there are loads of you that are very hendy when it comes to making things and this is your opportunity to sell your stuff on our website. Cool, eh? The problem is there hasn’t been a great deal of interest from you, and we reckon it’s because you’re unsure if your items would be right for us. Well it’s time to open up. Don’t be shy. Just show us your ideas. Whether it’s something traditional or totally whacky that you create we want to see it. So email stephanie@omlet.co.uk about your hendywork and send a photo if you can. You could be a hentrepreneur before you know it! The Royal Bath and West Show – tomorrow is the last day so why not go and take a peek? There are over 600 stands to browse, the UK’s biggest cider competition and some of the finest animals in the country. We will be there too so that’s a great reason to come along! BBC Gardener’s World Live – this fabulous show runs from 16th – 20th June and if you’ve never been before it is definitely worth a visit. This year you can book a place on a floristry masterclass, get new plants without spending a penny in the plant swap, and pop over to the Good Food Show for something to eat when you’re eggsausted, because you’re ticket can be used for both events. The Three Counties Show – this one is fun for all the family so why not get yourselves down to the Malvern Showground between 18th – 20th June for a great day out? See the prettiest pigs in England, watch food and drink demonstrations, or for some real eggcitement there’s the Red Devils parachute display. Be sure to see the Eglu too! Remember that comparison between the Eglu and the iMac back in the day? Well it’s here again, purely by coincidence this time. We had an email from Chris, sending us a photo of his piece of art which happened to feature an iMac with eggs inside. You probably can’t see from the picture but the keyboard spells out ‘chicken’ and ‘egg’ too. So why had he come up with this eggstraordinary piece? Because the Scottish artist simply likes to do ‘quirky stuff’. He said ‘birds that have such character can’t be eggnored’. We eggree! Have you been inspired by your pet chickens? If you’ve eggsperimented with chicken art why not send us a pic? It could be in a newsletter! Send to stephanie@omlet.co.uk. P.S. Our range of Pocket Gardens are now all reduced to half price due to being close to or having reached expiry. The sun is shining and this weekend is set to be an absolute scorcher. We eggspect the whole of Britain will be firing up the barbie and enjoying a few cold drinks, but don’t forget your pets during this heatwave. It is important that animals have access to fresh water and it is a good idea to give them a sheltered spot so they can escape from the heat. In third place was Jayne’s photo of her rabbit Chip who is five years old and very happy to pose for the camera. Second place went to Keith for his perfect picture of his pet Terrance holding a dandelion. But the medal for best bunny photo just had to be awarded to a picture we never thought we would see. Sent in by Harriet (6) and Jack (3), this photo shows Misty, Aslan and Snowy celebrating Aslan’s 6th birthday. They were treated to a yummy cake made of bread, carrot and parsley with wild pink flowers…lucky bunnies. We wonder if they played any party games like Pass the Parsnip. Thankyou to everyone that entered – it’s great to see you are proud of your pets! The Omlet shop is full of eggstraordinary gifts as well as bits and bobs that you won’t find anywhere else. Yes, our range of egg cups is eggstensive, but we have a cracking range of all sorts of kitchenware, including some amazing mugs that are perfect for your morning coffee or your afternoon tea. We have some eggsclusive news for you…rumour has it that there are going to be some new additions to the collection of mugs, arriving in the next few weeks. We are sure they will cause a bit of a buzz and eggcitement with any of you that love chickens or bees. Bees have been in the headlines again this week, with the population of the honeybee on the decline again. The good news is that since the launch of the Beehaus the number of newbee beekeepers has increased, and loads of people are doing their bit to help the humble honeybee. However, we had no control over the British weather, and the cold temperatures are not what we need to get bees buzzing. Throw in a disease that has been affecting the fittest and most able of bees and we’ve been left with a very sticky situation indeed. If you don’t want to take the plunge into beekeeping yourself there are still other ways you can help to save the bees. Growing bee friendly flowers is one step you can take. Another idea is to adopt a beehive. Sponsored by Saga magazine, this is a great way of showing your support, helping the environment and getting a little something in return. You won’t have the responsibility of taking care of a colony of bees yourself, but the money you pay will go towards funding vital research into honeybee health and help to educate beekeepers. You’ll even get a jar of honey from your adopted hive. Like the sound of it? Click here to find out more. Being eggsperts in the field of eggs we know a thing or two about omelettes, so we were shocked to hear of one restaurant serving a very eggspensive version of the classic dish. The Boisdale resturant in London is offering an eggslusive omelette on their menu for a whopping £90! So why the big price tag for this usually ‘cheep’ lunch? Well, the ingredients are somewhat eggstravagant. The eggs come from the Black-Headed Gull and can only be gathered for six weeks a year, by licensed collectors. Add these to some eggsquisite Scottish lobster and crab, fresh English asparagus and Italian truffles and you’re almost there. Then there’s just the dash of champagne. Although it might sound eggstreme to splash out almost £100 for an omelette apparantly city workers have been more than happy to try it. Click here to read the full story. Talking of omelettes, if you think you could create a cracking one you are going to love our latest competition. With the World Cup fast appoaching it is the perfect time to plan some tasty snacks for eating when watching the games, and what better dish to indulge in than a quick and easy omelette? We want you to design an omelette that represents one of the football teams in this year’s world cup. How about a fish and chip omelette for England? Or frogs legs for France? We’re sure you can think of some more original ideas than these…with, hopefully, some tasty results. Send us your omelette idea and we will shortlist our favourite 10 to cook up and put to the taste test. We will have a gallery of the best omelettes and the winner will receive a prize package that is perfect for cooking up the award winning dish. Just send your omelette design tostephanie@omlet.co.uk by Sunday 13th June. P.S. Did you see the Beehaus on BBC London news? There was a story on keeping bees and some of the Omlet team were interviewed on a rooftop in London. They were asked how popular urban beekeeping had beecome, and thanks to the Beehaus the answer was LOADS! Click here to watch the news clip!